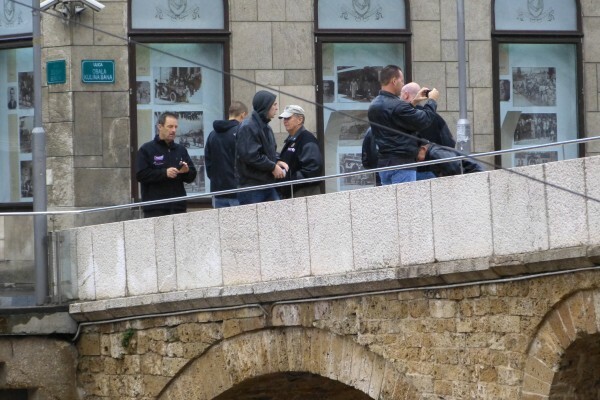 The Summit Racing group at the approximate spot in Sarajevo where Archduke Ferdinand was assassinated in 1914, thus triggering World War I. Examining the area are (from left) Greg Anderson, Sgt. Carl Scherman, Andrew Hines, Wayne Reed, Jason Line and Jim Greenleaf. 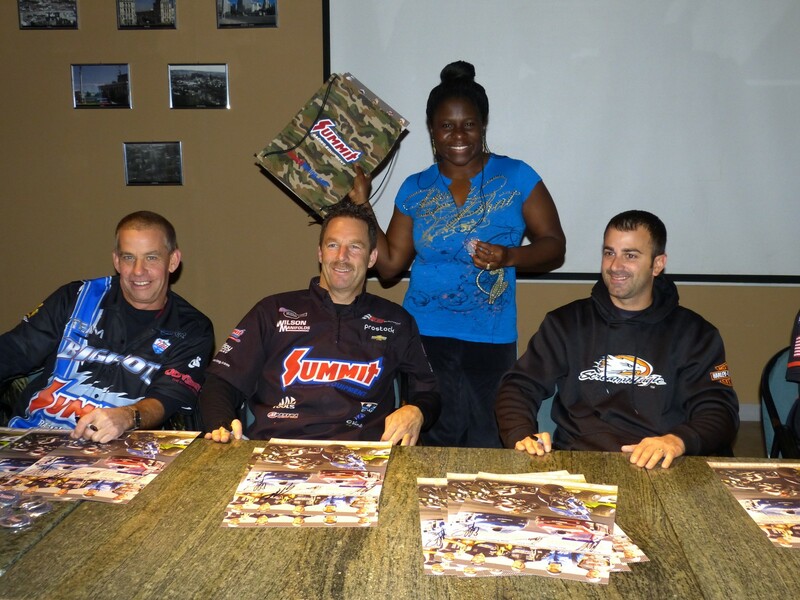 The Summit Racing group (from left) Wayne Reed, Greg Anderson, Jason Line, Cpt. 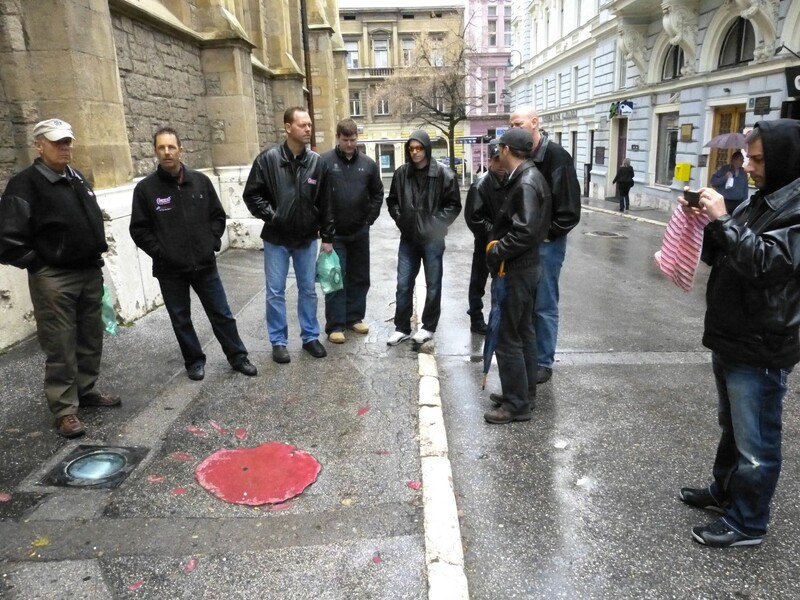 Paul Brown (Armed Forces Entertainment), Andrew Hines, Dan Runte and Jim Greenleaf listen to Damir Gulamovic, cultural liaison for Camp Butmir, describe the Sarajevo Roses. These red patches of pavement mark spots were throughout the city where Sarajevo citizens were killed during the 1,335 days, 1992-96, the city was under siege by the Serbs. Estimates put the daily bomb total at approximately 329, with a one-day high of 3,772. 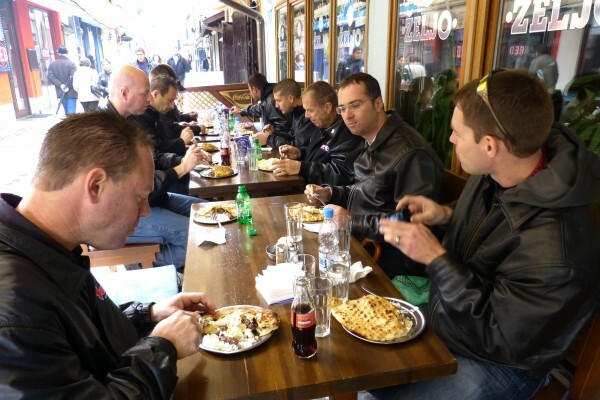 Enjoying a taste of Bosnian fast food, cevapi (pronounced cheh-VAH-pee) which are sausages served with onion and sour cream within bread, are (left side of table, bottom to top} Jason Line, Jim Greenleaf, Greg Anderson, (right side, bottom to top) Andrew Hines, Damir Gulamovic, Wayne Reed, Sgt. Carl Scherman and Eddie Krawiec. This compound within Camp Butmir houses American operations including a U.S. Post Office, the cultural liaison office, and an MWR (morale, welfare, recreation) room (satellite television, computer connected to the Internet projected onto a screen and a pool table). Sgt. 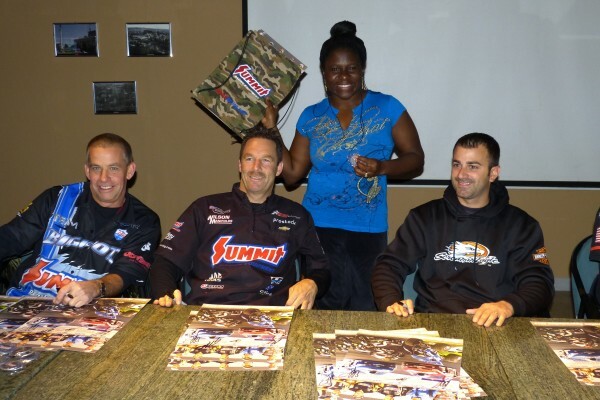 Mary Frayer shows off her Summit Racing backpack after receiving an autograph from (left to right) Dan Runte, Greg Anderson and Eddie Krawiec. Eddie Krawiec obliges a request to be a photographer for a NATO operative, snapping her picture with Andrew Hines and Greg Anderson at Camp Butmir. 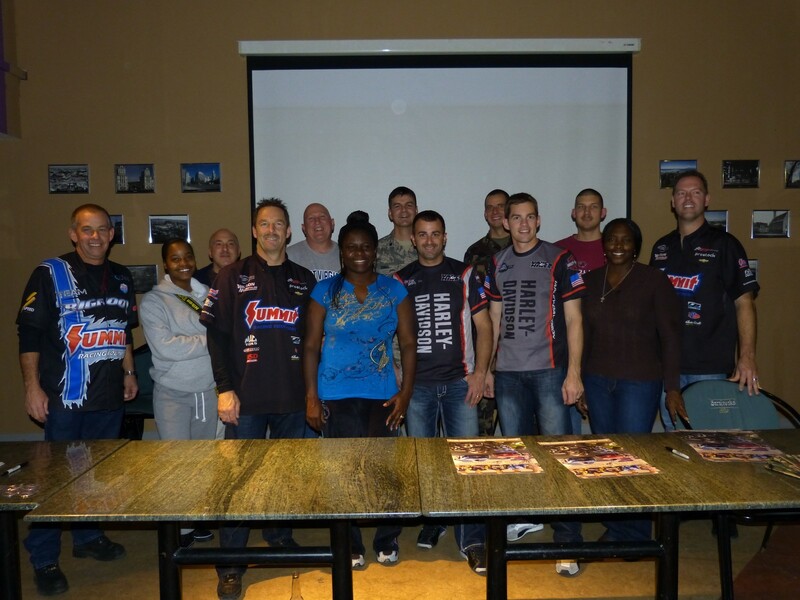 Soldiers and the Summit Racing group (from left) Dan Runte, Greg Anderson, Eddie Krawiec, Andrew Hines and Jason Line took a moment for a souvenir photo during the Camp Butmir program. 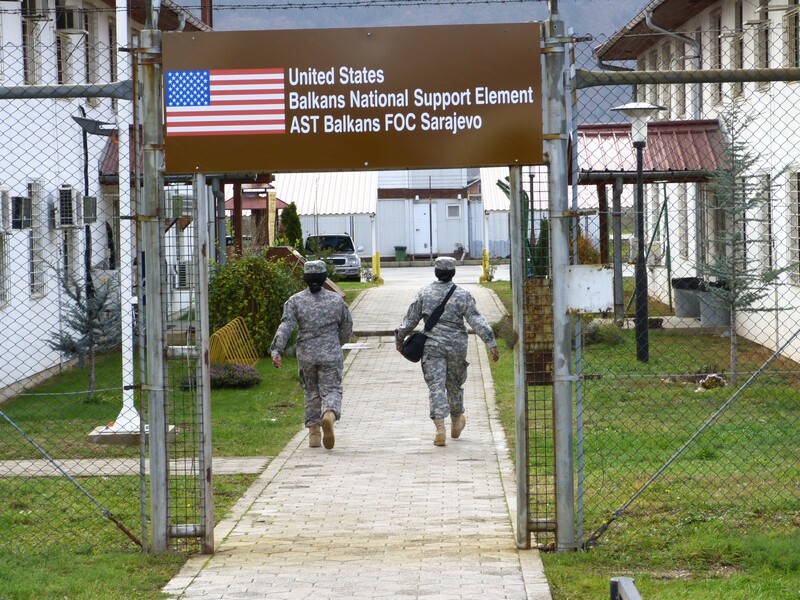 The final stop on the Team Summit/Armed Forces Entertainment visit to troops based overseas was Camp Butmir, the NATO headquarters outside Sarajevo. 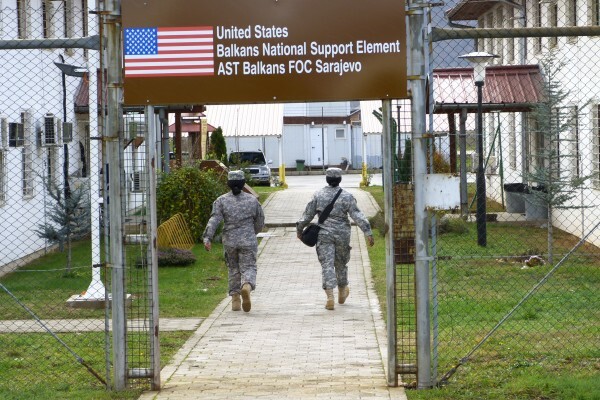 There are 22 Americans amongst the several hundred multi-national troops based at this Bosnia facility. 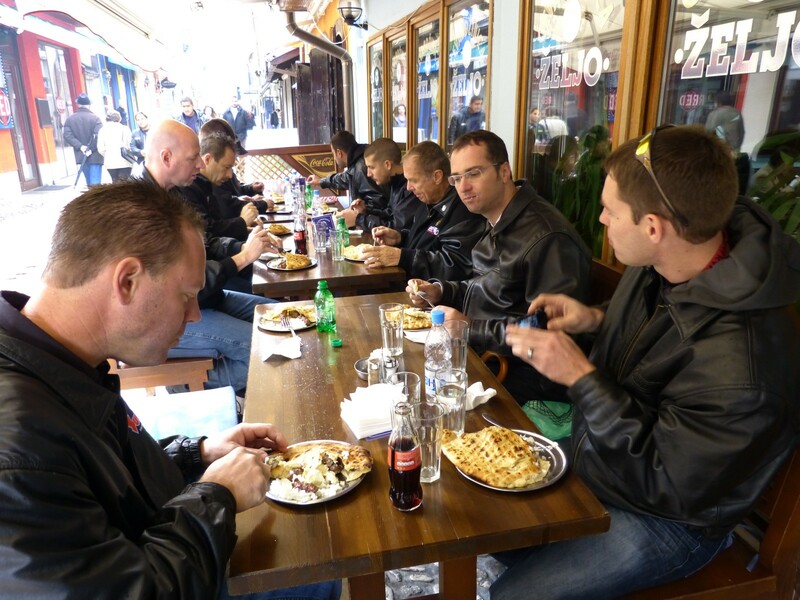 Dan Runte, driver of the Summit Racing/BIGFOOT monster truck, found this year’s trip unique compared to his other two trips because of the Kosovo and Bosnia visits. It’s neat to see different bases in different countries; that’s something we’ve never done in the past two years. 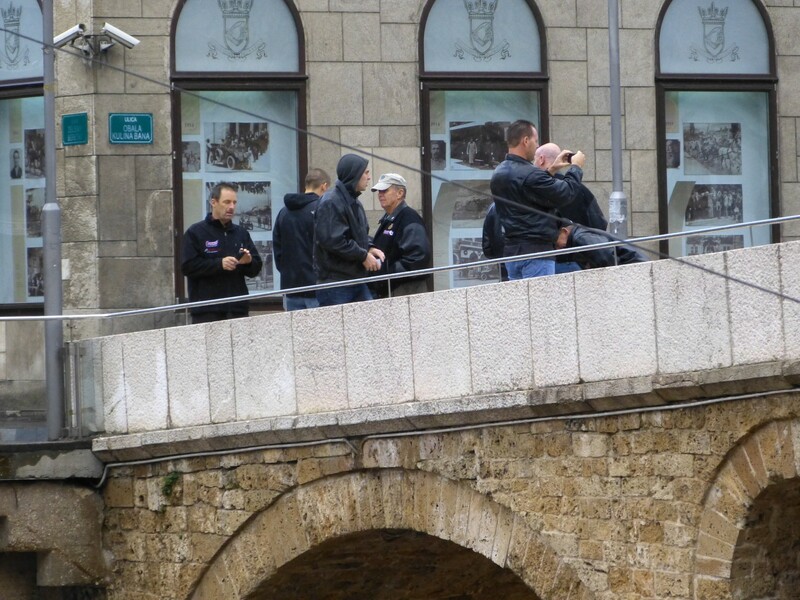 Today, for example, included a guided tour ofSarajevo. These side tours separate this from the other trips. We learned a lot about the history of this area, including how World War I started here and about the fighting within the city during the 1990s. This has been a neat trip because of the different cultures and seeing what these countries (Kosovo andBosnia) have gone through. 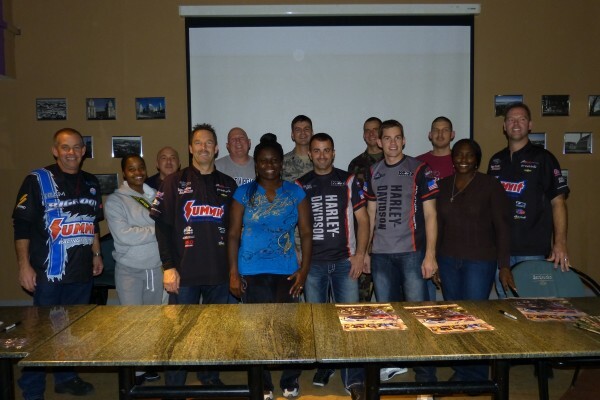 In the past, we’ve spent much of our time at Ramstein Air Force Base inGermany, which is huge. All of the troops we’ve seen are important to us, but this year has been more of a heartfelt trip for me because we got to spend time with the troops in smaller groups at each individual stop. The comparison is like having a classroom with 50 kids and one teacher versus being a teacher with a classroom of 10 or 12. You get to spend more time with each person, find out where they’re from, and learn more about them. I’m not a “big-group” type of guy—I have a hard time in big groups—so this worked out great. It’s neat to see these guys out in the field, and many of them have been “down range” [in battle zones]. My hat’s off to all these guys. I’ve said that every year. I know they all love their jobs, but when they’re here over Thanksgiving and Christmas, and they can’t see their families, that’s got to be tough. That’s why it’s great to bring them a piece of home—a piece ofAmerica. I was surprised how much time they wanted to spend with us. I guess we bring them a taste of home. A lot of them are racers, and they’re into the same kind of things we’re into. The non-fans were inquisitive as well. The question I’ve probably heard most on the trip is: “Do I drive the real BIGFOOT? Is it THE BIGFOOT?” And the answer is yes, and it’s still a family owned truck. They also want to know about driving BIGFOOT—how long have I been driving it, what size is the motor, or how fast will it go? 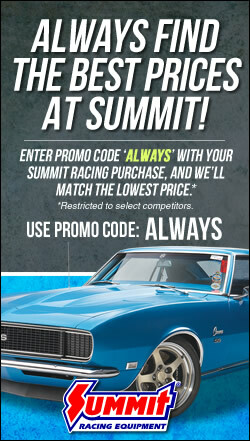 It seems like everybody wants to drive a monster truck. As far as I’m concerned, it’s the highest level of vehicle outside of what they do here in the military. Driving a monster truck is a great way to get rid of your frustrations. Your adrenaline goes nuts when you drive one. It’s just one of those vehicles you can drive and run over stuff and demolish it without blowing it up. It’s very hard to explain what it’s like driving a monster truck, but they all want to know. We have a totally different fan base from the other guys [with me on the tour]. 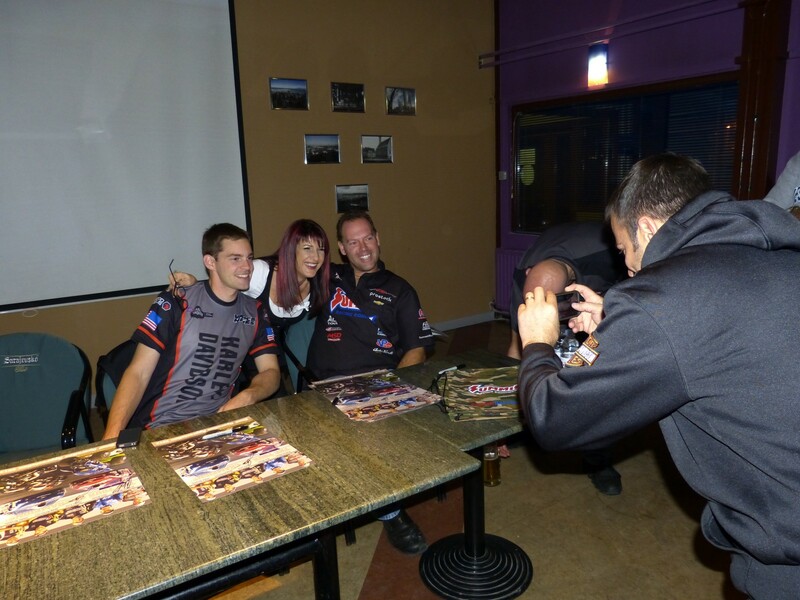 This group covered a lot of different bases—motorcycle, Pro Stock and monster truck. I think the troops enjoyed it!